It’s difficult to think of a cause that Kathy might advocate for more than Marquette (other than perhaps regular flossing). She co-chairs the School of Dentistry’s Building for the Future Campaign and served on the School of Dentistry’s Advisory Council and Reunion Council. But her leadership isn’t limited to campus. 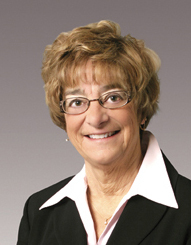 She was also the first female president of the Wisconsin Dental Association and only the second female president of the American Dental Association. She’s come a long way from the 15-year-old who snagged her first summer job during a dental cleaning, when Dr. June Hausmann Dhein, Arts ’37, Dent ’38, hired her to help out around the office. She worked for Dhein throughout high school and college, eventually following in her footsteps to Marquette’s School of Dentistry, where she was one of just two women in a class of 127. “I really only considered becoming a dentist — I always loved science, biology and genetics,” Kathy says. After graduation, she and her husband, Dan, Dent ’74, bought Dhein’s practice and have worked together ever since. Kathy’s commitment to dentistry inspired her father, who decided to give up his job as an auto mechanic to go back to school to become a dental lab technician. He worked in Kathy’s practice and eventually joined the School of Dentistry’s crown and bridge department as a dental lab tech and full-time faculty member. “It was a remarkable opportunity in life for him to enter a new career in his 50s, and he had a wonderful time working with dental students for many years,” Kathy says. In addition to her volunteer work with Marquette, Kathy is also active with Missions of Mercy, which provides comprehensive, free dental care to those in need. Last June, the Wisconsin dental community provided more than $1 million in free dental care to more than 2,000 patients in just two days, she notes.